You’ve hit the jackpot with the most comprehensive collection of casino games available for your PC & Mac Hoyle Casino Games 2012 is jam-packed with more than 600 variations on authentic casino games that will make you feel the rush and excitement of the casino floor. Double down with casino favorites like Blackjack, Roulette and Craps. With realistic Poker Tournaments you’ve got to know when to hold ‘em & know when to fold ‘em. Try your luck and spin-to-win with 100s of uniquely-themed multi-line and progressive video & reel spinner slots. Stack the odds in your favor with Keno, Pai Gow Poker & Baccarat. There are no limits to the fun these casino games bring. With an easy-to-navigate user interface, large cards and fast game play, Hoyle Casino Games 2012 will make you feel like the VIP you are. 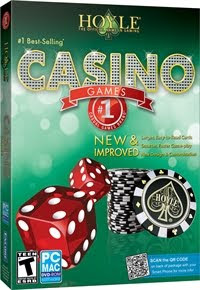 It’s all-or-nothing in this fast-paced collection where you can “double down or go “all in” without breaking the bank. Don’t wait for trip to Vegas to play your favorite casino games, purchase Hoyle Casino Games 2012 today. In Hoyle Casino Games 2012, you’re always a VIP! Review of Hoyle Casino Games seems like, you will really enjoy while play this game. You can read about casino games on the web and then practice a little before actually playing these games in the online casinos. Practicing the games is a very essential part of casino gaming. You cannot get away in the online casinos if you lose. Thanks bro for commenting !